The Power Soak was probably ahead of its time. In 1980, it was just normal to play with huge 100W stacks with 8 12' speakers. Cumbersome, but normal. The Power Soak had therefore a limited impact: the average amateur guitar player was not really interested in this expert's tool. The Rockman has helped killing the myth that only a big amp could deliver a big guitar sound. The Rockman, born two years later, arrived right on time. Before this magic black&blue box, practice gear sounded crappy, and the correct gear was clearly stage-oriented. Nothing in-between. If someone wanted effects, he had to collect a series of stompboxes, tweak them, plug that into his amp and hope the sound would be correct. Everyone was dreaming about something compact, handy, enabling someone to "plug&play" (this expression didn't exist in 1982). All the effects have been invented in the seventies, but it was time to pack that in a convenient manner. Time to leave the experimental era, and enter the maturity age of guitar gear. Tom Scholz had a significant experience of guitar sound. The sales of the Boston Debut Album are here to prove that his vision of guitar sound were shared by thousands of musicians. But the gear was missing: no-one but Boston managed to duplicate this highly compressed, heavy distortion sound, with this specific wide stereo image. A wall of sound, achieved by customising Marshall stacks, connecting compressors, wah's, EQ's, echos, and chorus doublers. How did this little black box manage to become a revolution in guitar sound ? 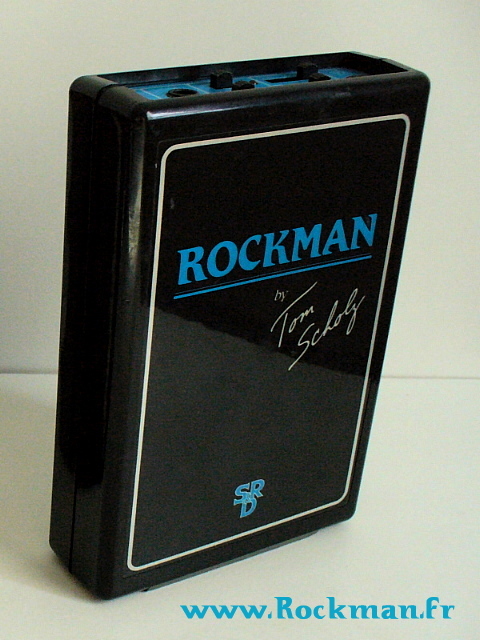 The Rockman was called "headphone amp". Fine, playing with headphones is interesting when you practice at home. But music is usually played in a band, or at least with a second player. The Rockman can be connected with another one, allowing two players to jam, still with headphones. But you don't make a revolution with just headphones in a bedroom! Stereo: before the Rockman, only professional musicians could use stereo, and the complete studio equipment was necessary to achieve it. The Rockman has made stereo guitar sound available to everyone. 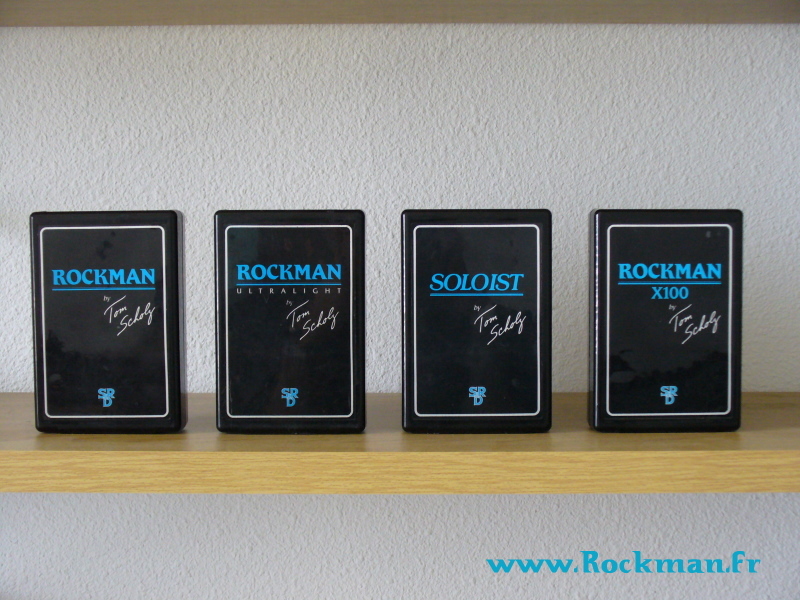 Multi-effects in a box: a Rockman consists of a compressor, a distortion, a cab sim, a chorus and a reverb, packed in the volume of a pocket book. Presets: tweaking knobs is usually painstaking and the result is not garanteed. A Rockman always sounds good. Direct connexion: no microphone, no huge cab, no heavy amp. Plug the guitar in the Rockman, plug the Rockman in the mixer: the sound is here, and no extra processing is necessary. Professional sound made available to everyone: you have heard this sound in tenths of major hits in the eighties. The Rockman was, all in all, the first compact stereo multi-effects device, and its most important feature was what we call now "Amp simulation". This term has developped in the nineties with the digital followers of the Rockman, but the revolution initiated by Tom Scholz had a name: analog amp simulation. The headphone feature and the portability were, after all, only secundary aspects of the Rockman. "Somebody once commented that if I make the Boston sound available to everyone, I'll be out of a job. Lots of people will be able to get my sound with the Rockman if they really want to; all they have to do is use a Les Paul, some SGs'll do it, a set of DiMarzio super humbuckings, turn the volume down a little bit and use the bridge pickup and they'll be all set. But it won't play the guitar for you. It certainly won't put Boston out of business. It'll make it a little easier for all the producers and engineers who've been trying to cop the Boston sound for the last five years, but I'm not worried." 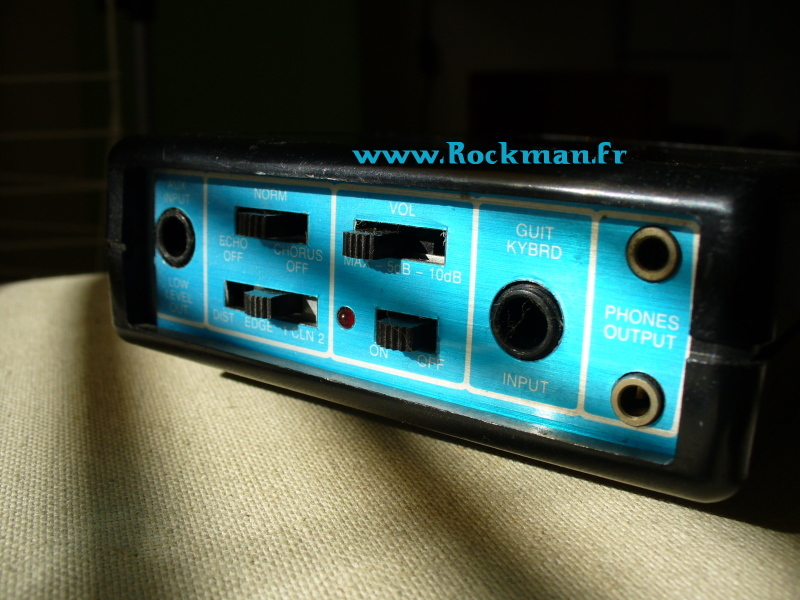 The Rockman design included all the technical basis of the future Rockman rack effects. While the common stompboxes have always suffered from a design-to-cost approach, Tom Scholz had, from the very start, launched his design-to-sound strategy. The Rockman was entirely based on low-noise TL072 Op-Amps: no cheap transistor buffer, no cheap noisy chips. The Rockman used a balanced power-supply, in conformance with the Op-Amp philosophy: more headroom, more dynamics, less noise. Yes, the Rockman requires 8 AA batteries, but it makes the difference between a correct design and low-cost 9V stompboxes. The Rockman sound is created via complex active filters, while common gear has only basic low-pass or high-pass basic filters. The Rockman is strictly made of standard, readily available components. In case something fails after a few years, it can be repaired for a few cents. This CLN2, with its crystal clear bright sound and its heavily compressed dynamics, is immediately recognizable: you have heard it in tenths of hits of the eighties - I would quote Don Henley's "Boys of Summer" as the perfect example. The stereo chorus effect had entered the guitar world in the late seventies - with the Boss CE stompboxes and Roland's Jazz-Chorus combos. Tom Scholz had been using his custom "doubler" to get the same effect on the two first Boston Album, and the chorus section of the Rockman is nothing but a commercial version of this doubler. The huge success of the Rockman made this chorus sound become a sort of standard. The last revision, issued in 1986, is the REV10, that has the recognisable side mini-jack for a wall-wart. This REV10 X100 was produced until 1994, with a 10th Anniversary model (extremely rare) in 1992. The Rockman and its follower, the X100, had two "economic" companions: the rare Rockman Ultralight (actually a RockmanIIB without reverb), then the cheaper Soloist, a simplified version of the Rockman "classic" series.